Roger Wall Unit is thoughtfully crafted for the purpose of providing a vast storage area and giving an aesthetic appeal to your living room. This wall unit is constructed from MDF with foil lamination. This storage unit harbours plenty of shelves and storage space store for many versatile items. This wall unit has a very sturdy construction and a firm built. Available in the colour dark walnut, this wall unit has a melamine finish which gives it a very classy and sophisticated look. 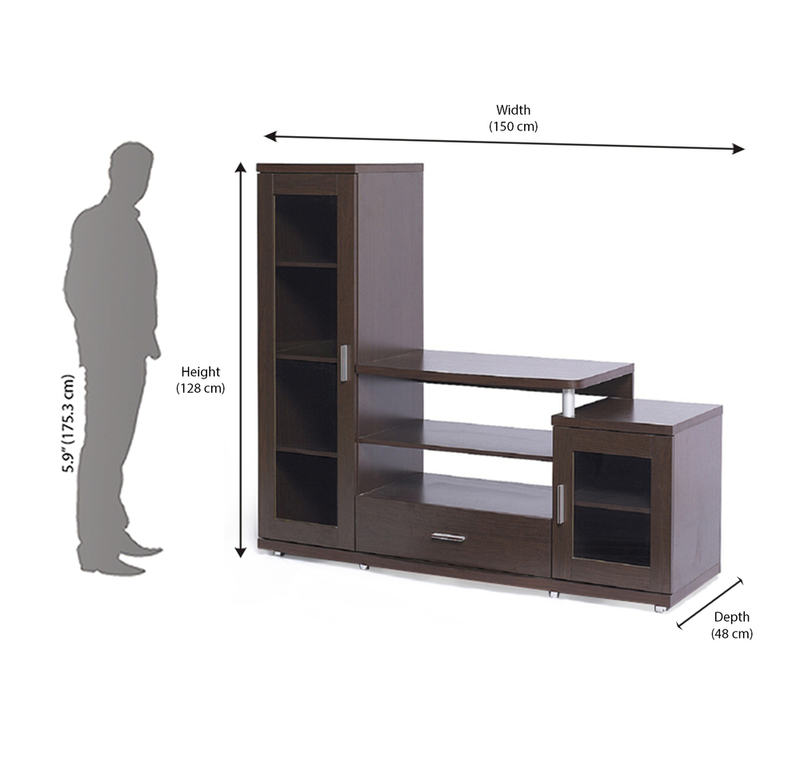 This wall unit has a height of 1280 mm, depth of 480 mm and a width of 1500 mm. This wall unit has 2 storage cabinets and one drawer that can be pulled out to its maximum length. The storage area embedded in these 2 cabinets and drawer is huge and can accommodate many items easily. Roger wall unit also ensures the provision of storage space for keeping your DVD player and music player. The legs of this wall unit effectively support the entire structure and ensure the balance and stability of the framework. The shelves can withstand an appropriate amount of weight and does not resort to breakage easily. Suitable for 36 inch TV.Provision to keep DVD Player/ Music System.Plenty of storage opportunities.